When bike-share launches this summer, 10,000 new public bicycles will be available at 600 stations in Manhattan and Brooklyn. The stations will typically be located about 1,000 feet apart from each other, ensuring a quick walk to a public bike from anywhere below 79th Street and in northwest Brooklyn. The exact location of the stations — this corner or that one, on the street or on the sidewalk — is largely up to each neighborhood to decide. The hyper-local planning begins next week at a workshop for the Chelsea and Hell’s Kitchen neighborhoods [PDF] and continues throughout the service area over the next two months. Last fall, DOT officials said that public comments will help determine where to place bike-share stations. Community boards can say “the following locations are ‘hell no’ for whatever reasons,” DOT Policy Director Jon Orcutt told Manhattan CB 2 last October. The stations have to be spaced appropriately and follow certain guidelines — no stations on narrow sidewalks or in parking spaces on busy avenues, for example — but within those constraints locals will get to choose where the bikes go. Next Tuesday, the city’s first bike-share planning workshop will take place. Hosted by Manhattan Community Board 4, State Senator Tom Duane and Assembly Member Richard Gottfried, the event will be an important opportunity for people who live or work in Chelsea and Hell’s Kitchen to help shape this significant addition to the New York City streetscape. The difference between a bike-share system where most stations are on the sidewalk and one where most stations are in the curbside lane may be determined at these meetings, for example. After Tuesday’s meeting, the next workshop will be the following week and cover Manhattan Community Board 2’s district: SoHo, Tribeca and the West Village. For a full and up-to-date listing of the workshops, including time and location, head over to DOT’s bike-share timeline. It’s great that going into the meeting the DOT can point to Thousands of suggestions to date. The usual public process is that starting from zero a few suggestions are made and then naysayers shoot them down because it’s too close to something (It’s next to a school, there’s a senior center then, that’s where people drop off their kids for music class) …then the only place left are on the margins of the neighborhood, rendering the whole enterprise set up to fail. The obvious locations to me in most neighborhoods are the side street parking places right off the main avenue, where they will effectively daylight / neckdown the crosswalks while providing easy access for cyclists to bikes near retail and protected lanes. That makes sense, I just hope they extend the metered parking further down the block, because these spaces are often the metered parking spots. Bike safety lanes must be made much more viable throughout Manhattan before this program can be considered safe. Perhaps it would make sense to close off Madison ave and every 10 cross streets to vehicular traffic and restrict for bicycle use. That would encourage people to ride…safely, confidentally and make this project sensible. 10,000 bikes with all the traffic (vehicular and pedestrian) will surely lead to great danger. @b0b5a0cf4ee09ff380fd46de4055393f:disqus Hmm, but it seems like bike share stations are a “desirable” (unlike, say, a chemical refinery/garbage-processing-center/etc). Aren’t “next to a school”, “next to a senior center”, “where people drop off their kids for music class” exactly the sorts of places you’d want a bike-share station? 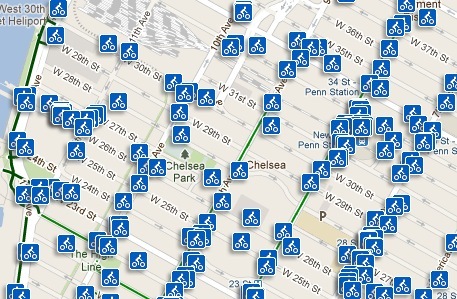 Bike share bikes would be an excellent way to get to school/music-class/a senior center….